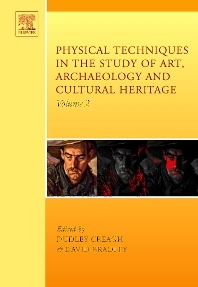 In Chapter 1 Dudley Creagh writes on "synchrotron radiation and its use in art, archaeometry, and cultural heritage studies". Loic Bertrand has written in Chapter 2 on synchrotron imaging for archaeology and art history, conservation, and palaeontology. Dr. Bertrand is Archaeology and cultural heritage officer at the new French synchrotron, Synchrotron Soleil (Orme les Mesuriers, Gif-sur-Yvette, France). He is charged with the task of raising the awareness of cultural heritage scientists to the use of synchrotron radiation for their research. Chapter 3 has been written by Ivan Cole and his associates Dr David Paterson and Deborah Lau. This is concerned with the holistic modelling of gas and aerosol deposition and the degradation of cultural objects. Dr. Cole is Deputy Chief of the Novel Materials and Processes Division of the Commonwealth Scientific and Industrial Research Organization (Melbourne, Australia). He has over twenty years experience in involvement in projects concerned with the preservation of cultural heritage. Ivan is an internationally recognized leader in the field of the life cycle of materials and the development of protective coatings for metals. In Chapter 4, Giovanna Di Pietro describes two different types of experiments she has undertaken in the study of the mechanisms underlying the degradation of photographic media. In the first Dr. Di Pietro describes the degradation of old back-and-white plate. In the second she outlines her attempts to understand the mechanisms by which comparatively modern motion picture film degrades. A significant part of this project involved trying to ascertain exactly what dyes were used by Kodak in their motion picture film from about 1980 onwards. An entirely new technique for the remote investigation of the pigments in paintings is presented by Maria Kubik in Chapter 5. This technique will significantly enhance the ability of conservators to study the palette of pigments used by artists, check for repairs by others, and detect fraudulent paintings. Professor Dudley Creagh, Professor and Director of Cultural Heritage Research, is an expert in the design and development of new analytical equipment, especially equipment using synchrotron radiation, for the study of materials, especially cultural heritage artefacts. He had led research on such topics as valuable medals (e.g., Victoria Cross), the protection of objects against corrosion, Australian aboriginal bark paintings, and the degradation ofiron-gall inks on parchments, movie film, and painted surfaces. David Bradley is a Reader at the University of Surrey, Secretary of the International Radiation Physics Society and edits the journal Applied Radiation and Isotopes. His research interests concern photon scattering, radioanalytical techniques for determination of trace element concentrations and the development of synchrotron techniques for the characterisation of media.